Our HIRE KART packages are listed below – starting from a very popular £20 per person (session) and ranging through Lydd15, Lydd30, Mini GP and Grand Prix adult packages that are suited to groups of people wanting a fun and exciting event. All the necessary equipment is provided, with a full safety briefing preceding your event. 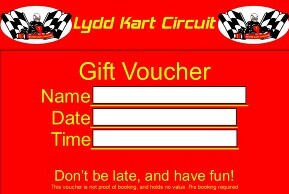 Please note that although hire kart session(s) & adult events are arrive & drive, ‘Booking in advance is necessary‘. We cannot guarantee to accommodate ‘walk-in’ customers on track or without a short wait. To discuss a booking please contact/phone the circuit direct, where you can then confirm a date and time. Please note we do not have ‘on-line’ booking facilities. Adult events on either a Monday/Tuesday/Wednesday/Thursday also require full payment up front please at time of booking, thank you. Refer to the website calendar please to see when Saturday & Sunday hire karts run. Please be reminded that weekend hire kart time slots get booked up hugely in advance; please contact us as soon as to check weekend availability, thank you. Sessions available from £20 per person. A 1 x 15 min session on track is £20 per person (child or adult). A 1 x 30 min session on track is £40 per person (child or adult). Note on some days we can split a half hour session into 2 x 15 min sessions, to be confirmed when booking. A 1 x 60 min session would be £80 per person (child or adult) which could be 2 x 30 min sessions on track. AGE: From 6 years onwards (Already 6 years old – not in the year a child is 6. Children must also be over 1 meter tall). Please be reminded that anybody under the age of 16 years is not permitted to drive on the senior circuit in a hire kart. ON THE SENIOR CIRCUIT The following adult hire kart events use our senior twin engine Prokarts (18 years and over). However, we ‘may’ allow 16 & 17 year olds to join these bookings. As a guide only, our adult karts can take a size up to XXXL and a height from approx 5ft (1.5m). We can also offer Endurance Events, from 90 minutes races through to 240 minutes races. These start at £120 per team and run through to £270 per team, depending on which event you choose. Our endurance events are all based on a minimum of 10 teams. All endurance events have a 1 x 20 min qualifying session. BAMBINO Not to be mixed with other groups, but we do allow a parent, if wanted, to join them. Note that if a parent does join a Bambino booking parents then use the Junior karts. Please contact the circuit if you would like to discuss this further. Equipment The supply of hire kart, helmet, suit & gloves is inclusive with the cost. If any driver has their own full faced crash helmet (not motor cross) & suitable gloves they are welcome to use their own. However, if your own crash helmet is not of a good standard we will ask you to use ours. Footwear For anyone wearing summer sandals or open shoes please bring a pair of trainers or flat heel boots to change into before going on the circuit.